Michael Crouch and Jamie Duncombe of Creature Encounter are Street Theatre Alchemists, Theatrical Engineers and Master Puppet Makers, continuing in the proud and ancient traditions of nomadic Showmen. Our mission to turn the world on its head, ignite the imagination by achieving the impossible & serve humanity by re-inventing the Puppet, Clown and Mask for contemporary audiences. We fuse Special Effects, Artistry & Street Theatre Spectacle to create a picture book world of roving eccentrica and performance. Inspired by the belief that Street Arts are the most accessible, democratic and altruistic of art forms, we deliver our exotic beasts in our communities beating cultural & economic hearts. Touching the residents, transforming the space & hoping to leave these communities, our society and this world with a sense that for the courageous heart...anything is possible! 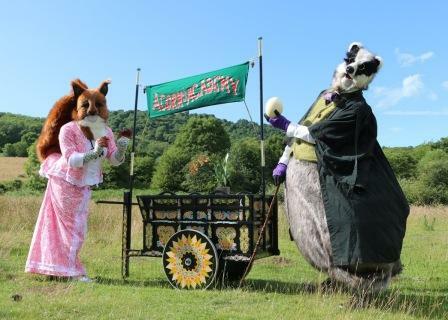 Professor Bramble the Badger pushes a beautiful gypsy cart which he uses as his mobile class room. He and Head Mistress Miss Nutella Nutkins are on a field trip, collecting new objects for their show and tell collection. These objects in turn become part of a game of Animal, Vegetable or Mineral? Each introduced to the children by a puppet guest lecturer. The game allows children to discover the wonders of the Natural History as they handle real fossils, minerals and other materials. Meet the adventurer Capt Jon Voyage and his beautiful dinosaur 'Odysseia the Parasaurolophus' torn from the pages of a Boy's Own adventure, and shipwrecked on our shores. Help the Capt as he studies his map, in an attempt to return the beast to the late cretaceous period of the Land that Time Forgot. Or make friends with Odysseia and help her understand that not all humans are barbaric cavement and women. Whether you join them on their quest or pose for a selfie, you are sure to have a Jurassic lark! Pushing a wooden cart through the crowd, Sir Aurelious Jones brings smiles, laughter and the chance for the brave to witness true magic! Aboard the cart stands a small tent which hides a secret. No less than the last surviving Fairy Queen! Aurelious will invite those inquisitive souls to step forward, peer inside the tent and witness this most precious pint-sized person. Proving that even the smallest of us can leave the biggest impression, the Fairy Queen will touch your heart and leave you wishing for the magic to last forever! 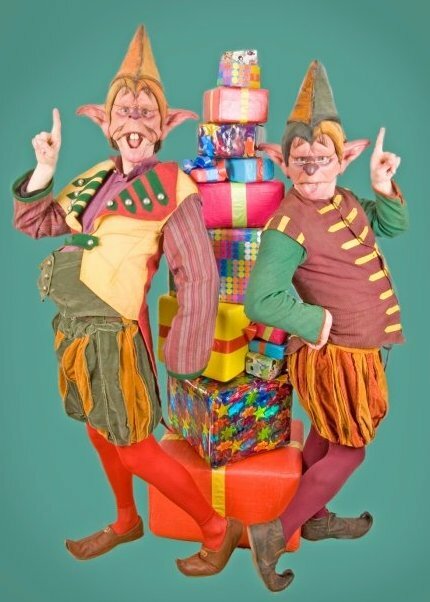 Two colourfully dressed elves carry a spectacular swaying eight foot tall tower of presents. Armed with quill, clipboard, pocket watch & whistle Head Elf Horris attempts to keep their delivery on schedule, as Junior Elf Norris struggles and clowns with the teetering tower of presents. Both elves are ever watchful for people with names on the list of those who have been good! From across the desert sands come legendary storytellers Ruby Murry and Baba Ganush on their magical flying carpets. Played in the style of Victorian men and their magnificent flying machines mixed with the slap-stick comedy of a Bernie Clifton style ostrich illusion. These colourful, comic characters demonstrate powers of flight and levitation, whilst enchanting all with their tall tales and terrible jokes collected from the far flung corners of the globe. 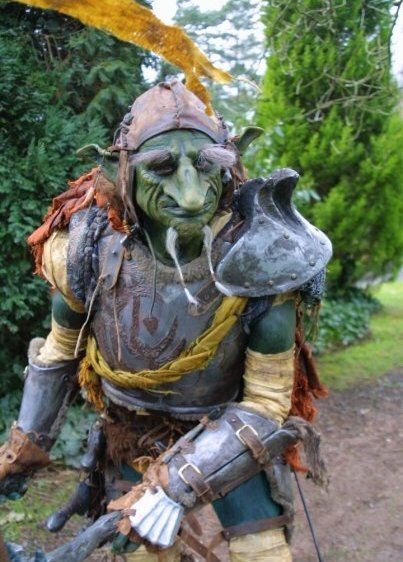 The Goblins have arrived! Prince Oddness and his servant Grotsick are questing to find a new Princess, auditioning members of the public they bring their topsy-turvy perception of our world into magical life. But whose foot will fit the enchanted glass slipper? 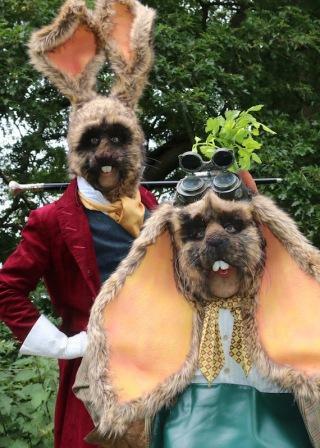 Teddy & Otto are the friendliest, funniest and furriest characters you're ever likely to meet. 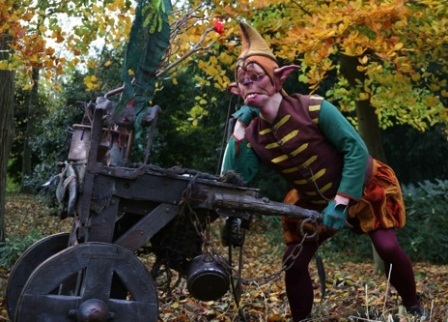 Join them as they wheel a wooden cart through the crowd, marvel at their ancient relics from the greatest fairy tales ever to be told and test your knowledge in a quiz of fairy tale fantasy! From the Forests of Eternal Snow pads the giant white lion. A mythic emblem of this season celebrating the light of human kindness in the depths of winter's darkest days. 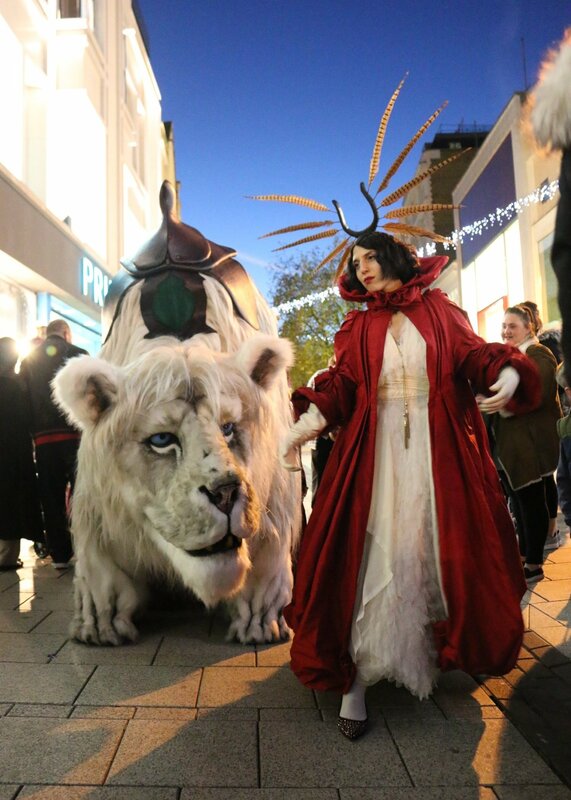 Accompanied by the Red Queen and her servant, the lion offers protection to this powerful feminine archetype, herself a role model for young girls seeking an alternative to Mother Christmas. Come forth and witness the mystery and majesty of the largest lion to walk the earth, be certain to step forward for a photo with these magical characters and take home a memory of the light in the darkness! 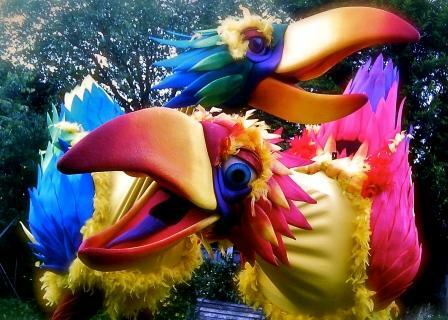 Combining animatronic puppetry, spectacular costumes, magical characters and music into an experience like no other. 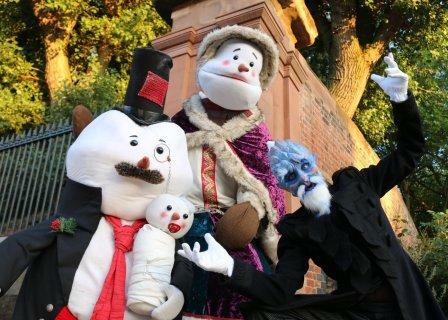 Allow Mr Frost the butler to introduce the Victorian Snow Family...Presenting the esteemed Lady Euphemia Winterbottom, her husband Major Berty and their little urchin Baby Snowflake. With his business interests in the Far North failing and his assets frozen the Major has hit the sherry. In response the hard times the family now work the mix n'mingle circuit spreading festive cheer. Combining music, animatronic puppetry, prosthetic masks, stunning costumes and comedic improvisation the Winterbottoms bring the spirit of the season into colourful life. 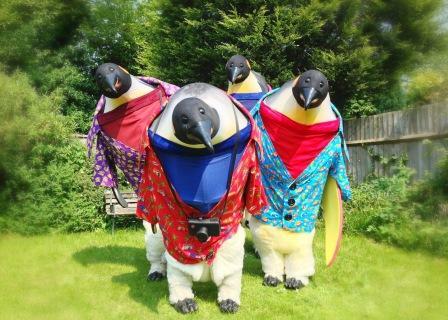 Meet adventurer Captain Jon Voyage and his avian amigos, two vibrant birds in all the colours of the rainbow. Help them explore their surroundings with inquisitive beaks and joyful squawks, marvel at their exotic beauty, make your friendship felt by stepping forward for a bright and brilliant photo with the Captain. Please remember, they won't bite but they may decide on being friends forever!